It's 9:30 pm. There's still plenty of light in the sky, and the street lights have just come on. Birds have chirped their sleepy goodnights and the air is still. These days the garden grows almost visibly each day. Just now the strawberries are the stars of the potager. I've harvested at least 8 pounds already. It's a bumper crop in our area. We're enjoying them every day with our yogurt in the mornings. 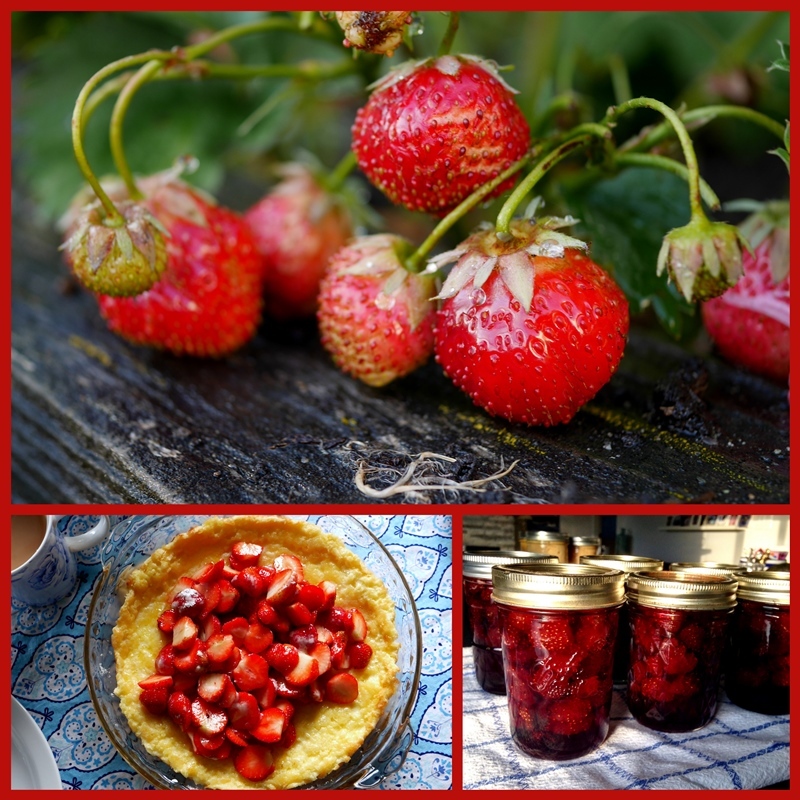 I made some strawberry preserves, froze several bags of them, concocted a fresh strawberry pie, and on Saturday we enjoyed a puffy oven pancake with mounds of fresh berries. For showiness, the poppies have taken over. Huge pom-pom like heads in grand profusion fill one corner of one of my vegetable beds. Two plants seeded themselves there and I let them be. There are others in the flower beds that haven't yet bloomed, so I'm looking forward to more of these beauties. I discovered that the poppies don't do well in cut arrangements. I put together a vase full yesterday and ended up taking it outdoors. I found the scent mild, and not unpleasant, but it seemed to stifle the air in the room. Last week's arrangement of roses and feverfew, along with lemon balm leaves, sprigs of lambs' ear, and some Portuguese laurel was a much better choice. I have a smaller version of this on the mantel now. 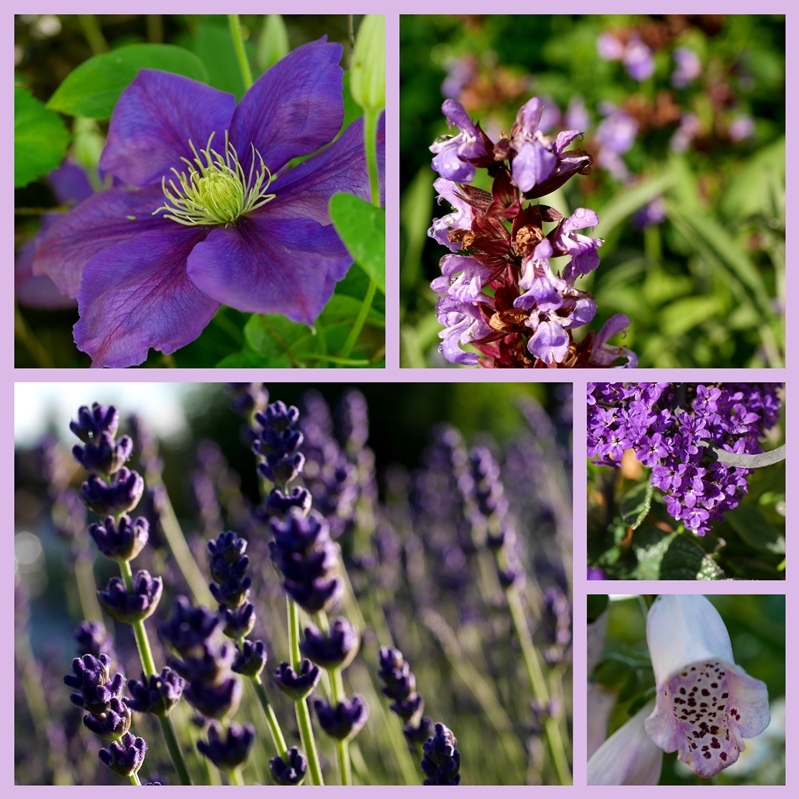 Here's a collection of purple flowers from the garden today - clematis (General Sikorski), sage blossoms, heliotrope (I do love that vanilla/baby powder scent), foxglove, and lavender. The garden is a richness of blooms and each day I meander through it and discover something new. I have 7 more instructional days of school, then a week of marking exams, writing report cards, and tidying up. I'm very ready for the end of the semester. At the same time, I don't want to wish away these June days, for they are so beautiful. How are you faring in this 6th month of the year? In the 30 minutes it's taken to finish up this post, darkness has fallen. Silhouettes of trees and houses stand against a summer sky of not-quite-dark. Our decorative solar deck lights have just come on - it is still not quite dark 10:10 - and I love it - the best time of the year. Your flowers are fabulous - my daisies are about to bloom and I have fuchsias with big buds - we are a little behind in our yard because of all the trees nearby. We are enjoying the fresh strawberries - awwww summer - I put some in the freezer for making jam later, as we still have plenty of jam for now. Have a grand time off school. Hopefully it warms up soon - we've only been getting the mid 60s over here on the mainland - wish it would warm up a bit. What a beautiful post to begin our Mosaic Monday, I am in awe of the exceptional strawberry crop such abundance and so tasty too. Love the purple mosaic, it is quite stunning. We have just enjoyed a super visit from new friends and are looking forward to a short trip to the Vendee and Dordogne regions next week, June is flying by for us. End of term excitement is to be expected but so is your reluctance to wish away these final few days, I'm sure you'll savor each day as it comes and enjoy the summer even more when school days are behind you at last. Summer darkness arrives here shortly after 7:00 p.m. The sun rises much earlier than I'm wiling to get up. :) Your strawberries sure look good. And those pom pom poppies are such a pretty sight. Not all flowers are meant to be cut, that's for sure. Folks love lillies, but after a few days, the smell to me is less than desirable. Have a good week. I would love to wander through your garden, Lorrie. Your flowers are so lovely and so Summery. Heliotrope is one of my favourites too. I love Strawberry season and in the past took the Grandchildren strawberry picking to the local farm. Sadly there is nothing local so I am buying supermarket strawberries, which are not as good. Such a stunning floral arrangement. You have a beautiful garden and rich harvest of strawberries. Those purple flowers are so lovely. Yes, I had the same experience of poppies. They are beautifully flowering in their bed, but sadly the arranged poppies in a vase die too soon. It is sad to see the fallen petals looking still fresh. Hi Lorrie, Your poppies will last for days in water if you singe their stems for 10 seconds over a flame. Protect the flower heads with a soft towel and you can singe several at a time over the low flames of a gas stove. It works every time. Pictures with instructions can be found under Poppies in my Art and Alfa blog. June days are lovely! We had a strawberry lunch yesterday at church. When I was a young girl, the kids in our neighbourhood used to pick strawberries for extra vacation money. I used mine to buy a nicer school wardrobe. It was back-breaking but music played on transistor radios and summer romances began. These final days at school are busy. The purple flowers seem to dominate at this time of the year. You've really made my mouth water with the strawberries! I love fresh fruit and it is perfect with yogurt or cottage cheese. Since I don't eat sugar....sweet fruits are dessert to me! Enjoy your week! Happy summer! Those poppies!! It is my quest to have poppies bloom in my garden. They don't seem to be difficult as people tell me, but I have planted seeds, thrown out seed, transplanted plants a number of times and finally this year I have a few coming, but a couple started and died back so I'm not optimistic. I will sow more again this fall. That variety is just so striking! Your flowers are so pretty! I'm also loving the longer days at this time of year. I'm trying to savor these all too fleeting summer days. Yes, I need to get more strawberries before they pass me by. I put some in the freezer before we left town for a few days, but need some for my yogurt or ice cream. The pie sounds good too. Loving this time of year for all the wonderfulness of the flowers. Little vases here and there just because I need them here and there. Your garden is lovely. I have feverfew blooming and roses. I may have to clip some for a bouquet tomorrow. The month is flying by, and I’m not trying to rush it. Wanting to savor and enjoy it. I love to be in your garden since i love all berries! I my, your pics and your descriptions of the strawberries and what you had done with them made me want strawberries. Delicious! We used to be able to go to a "pick your own" strawberry farm, and made strawberry jam etc, but unfortunately the place is gone now. Your garden is gorgeous. The strawberries make me swoon!!!!!! Nothing better than home grown strawberries. Lucky you! Have a fun filled week! Lorrie, I like your new blog look. Very chic! And I love your June post. Oh yes, we don't want to hurry along June, but it seems to hurry all by its own self. On the days right now where we could be sitting out enjoying the long summer evening twilights, we have clouds, rain, and much wind so there is no sitting outdoors. We needed rain so I'm not complaining. Your strawberry crop looks so inviting. As do all the photos from your garden. June is a lovely month. The colours in your post are stunning. ....and the strawberry preserves are WOW! Lorrie, you garden is always quite full of beauties, and I love the beautiful arrangements you bring indoors as well! I am sure that you are ready for a little break in the schedule. I know I am. We are faring well this June. We have had some cooler, lower humidity days this week which is always a treat here on the East Coast. The heat and humidity will return, but we'll enjoy these lovely days while they linger. I don't think I've ever loved a June more than this one!! Your purple flowers are even more gorgeous all together like that - I have never grown a clematis but you make me want to... plus I think it is a clematis that poked through the fence from my neighbor's yard today, and it is also lovely. June has started beautifully in your corner of the world. Wow! Those strawberries look great and I'm smacking my lips over that jam and pie. Lovely collages. Your garden looks happy and so alive! You have so much to enjoy there, all the result of your hard work. I picked our first beans today and it was a real joy! How fortunate you are to have a bumper crop of strawberries, Lorrie! They are a family favorite here, along with blueberries. Your pop pom peonies are gorgeous! I've never seen that type before. I have a couple of peony bushes but they don't gt enough sun to really explode with blossoms. I'm happy to get 5 or 6. I noticed the deers don't bother them so I may plant more in my backyard which gets more sun. I like your new blog template design! I have so much work to do in modernizing my blog, but so little time to do that right now. Hopefully one day soon I'll jazz it up a little. The strawberries are so sweet this year. We have enjoyed them immensely! Unfortunately, the season is pretty well done. Beautiful blooms. Enjoy your final days of school! I am jealous of your bumper crop of strawberries … the ones you get in the store just can't compare with a home-grown berry. Your flower arrangement is stunning - so clever to include those bits of lamb's ear …. June is going well - we are excited for the arrival of my in-laws later in the month. Then, I fear, summer will reach warp speed and it will be mid-September before we know it, almost time for the snowflakes to return!!! Your new blog look is beautiful! As are the flowers from your garden! Wishing you all the best as this school year comes to an end. It's gone so fast! Your garden looks lovely, I do like your mosaics. This year is simply flying by, it's the middle of June already!!! Most of our schools finish the term around the 20th July … so a few more weeks to go! Beautiful flowers! I'm envious of your strawberries, and the pom pom poppies are gorgeous! Aren't you lucky to harvest your very own strawberries from your garden, Lorrie!? One of my favorite desserts is strawberry pie. Your flowers are gorgeous in your June garden. I've been enjoying the June evenings, by relaxing and reading out on my patio, when the temperatures are a little cooler. You don't have too many days left before you're free for some summertime fun! So many strawberries and I know they must taste so much better than the store offerings. Your garden is lovely Lorrie - a lot of work I know!